Tapastry, hot on the heels of Baresca opened its doors recently to provide more small plates of Spanish food for us in Nottingham. It’s a little tucked away on Heathcoat Street where a small, rustic space awaits. It’s the sort of place that looks like it might deliver simple, flavourful food well. No more than a handful of tables make up the split-level dining space, and on the evening we went there was 1 front of house and 1 chef. I subsequently have learnt that they are a couple, a brave venture! The menu is quite sizeable, I perhaps expected a smaller repertoire given the size of the restaurant. The majority of these were the Spanish food that one would expect, though there was the odd departure. The first dish that arrived was one of those that took inspiration from outside of Spain, outside of Europe in fact. Meatballs were with lemongrass and chilli with some coconut milk. The Asian flavours were perfectly pleasant but I wasn’t quite convinced by the combination. 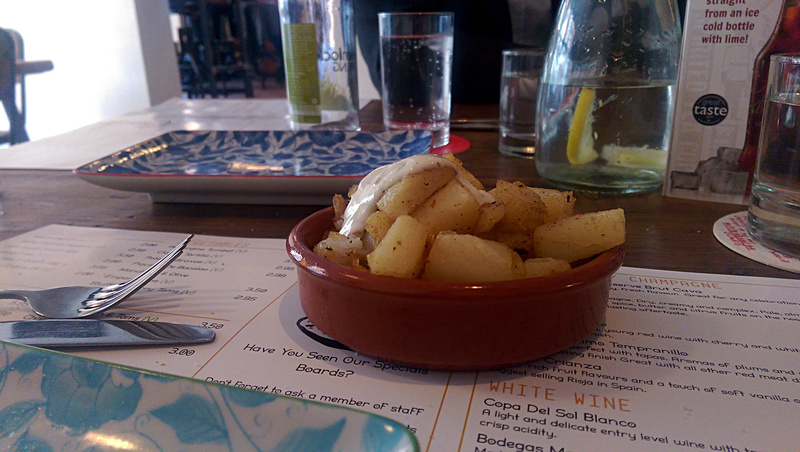 When the Patatas Bravas arrived I did wonder whether they just hadn’t had a delivery of tomatoes. 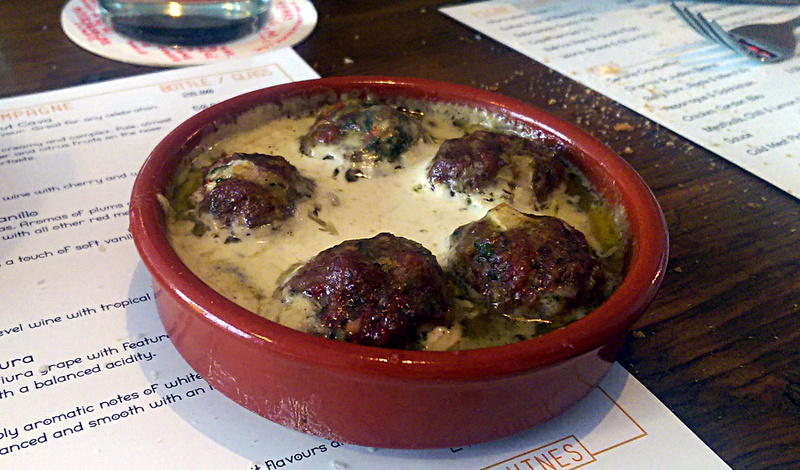 Thai flavoured meatballs and just aioli on the potatoes! They again were ok but I wanted the punchy tomato/paprika sauce to bring them to life. A pork belly dish featured pretty basic presentation that could have come out of my kitchen at home. Looks aside it was pretty tasty, the crackling was particularly crispy which is always a pleasure. For me though it was just a collection of nice items rather than a cohesive plate of food. There were only 2 dishes still to come but little was I to know by far the best and worst was yet to come. Calamari with cous cous was an unpleasant combination of textures. Both elements were overcooked so that the squid was tough and the granules were mushy. The flavour was too strongly fishy for me and failed to make up for the downfalls which really let the dish down. In great contrast I loved a bowl of clams cooked with Serrano ham in Sherry. Sweet shellfish, salty ham and a bit of sour sherry liquor was an excellent marriage. I could happily have had a bigger bowl of these with some crusty bread. Service was slow, though not the fault of the solitary waitress who was doing her best! I had expected prices here to bit a little cheaper than the competition but actually there wasn’t much in it. The pork belly was £7, meatballs £6 and unfortunately if you’re charging as much as others and trying to produce similar food there is nowhere to hide. 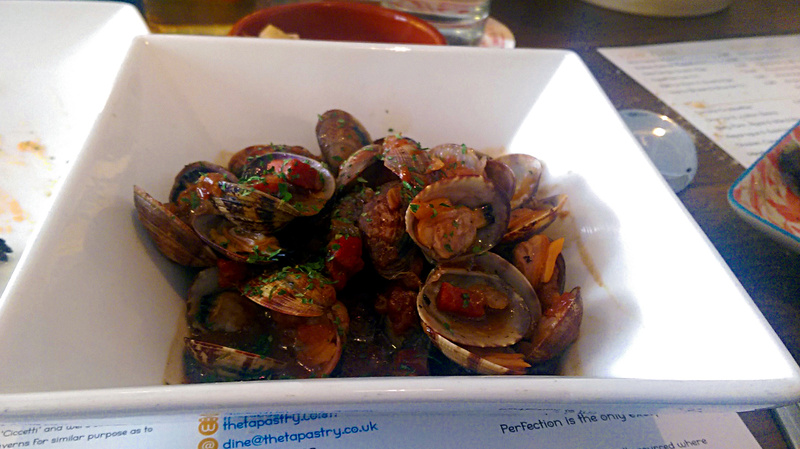 The quality, clams aside, wasn’t up to the standards of the other established tapas restaurants in Nottingham. I can’t see why I would choose to return here over the local favourites; Iberico and Baresca. If I do pop back I should probably go for a paella, I since discovered its where the chef cut his teeth cooking big pans of the stuff across Nottingham for special events.